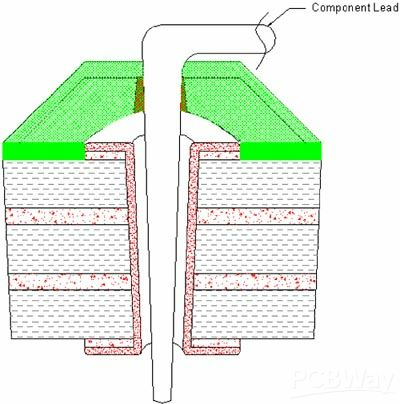 a thru-hole component is described as a component leaded with a wire or a metallic lead that is mounted to the board by placing the lead though plated holes in the board and then soldered. Figure 3-2. Applying heat evenly to the lead and the pad/hole—step 2. Figure 3-3. Contacting the end of the iron—step 3. The quality of the solder joint is important for several reasons. The solder joint is the actual connection between the component and the board. The quality of the solder joint is equivalent to the quality of the connection. The "look" of the solder joint is less important but is usually indicative of the quality of the solder joint. Figures 3-1 through 3-4 display the general steps in soldering a thru-hole component. In step 1, the hole and pad to be soldered are prepared, with the lead being placed into/through the hole. 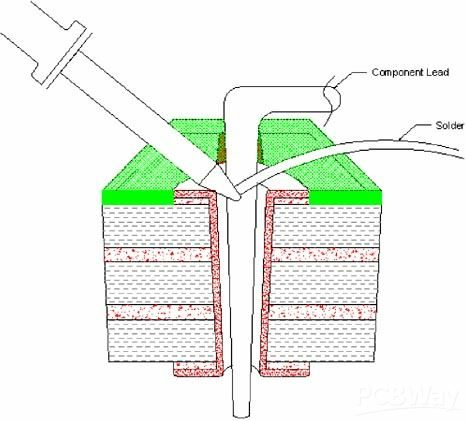 The lead should be placed in such a way as to keep the bend above the soldered area, reducing heat and solder requirements. 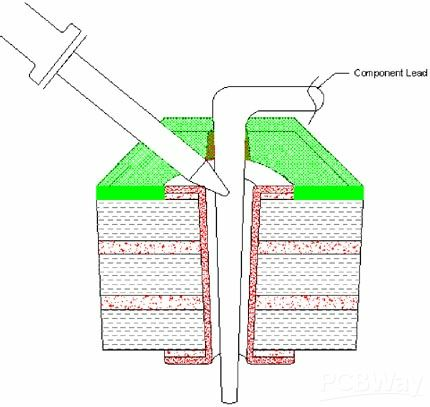 In step 2, heat is applied evenly to the lead and the pad/hole, heating the material so the solder will adhere to both surfaces. 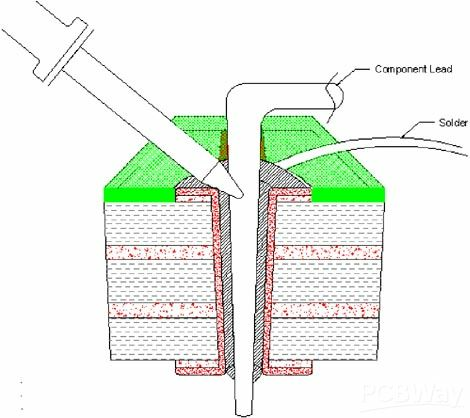 In step 3, solder contacts the end of the iron, which causes the solder to change into a liquid and flow into the hole. In step 4, solder flows through the hole, creating a mound on both the bottom and topside. Since this lead was soldered from the topside, the bottom side should be inspected for adequate solder and joint quality. Some assembly may require solder from both sides to ensure quality. Adequate clearance inside the hole allows good solder flow through the board, allowing only one side to have solder applied. Tight clearances may require soldering on both sides, increasing soldering time. Figure 3-1. Hole and pad to be soldered—step 1. Figure 3-4. Soldering a lead—step 4. Array (BGA) PCB extremely inefficient in terms of optimizing space usage. electromechanical relays that require great strength in support.